Vostalgic - Welcome to Vostalgic.com! Hey guys! Thanks for visiting my new blog site! For those of you who don’t know me, my name is Long Vo. Most of you may know me as one of the original founders of Gaiaonline.com while others may know me from my work on various Capcom/Udon projects such as Super Street Fighter 2 Turbo HD Remix or Tatsunoko VS Capcom. You are currently reading Welcome to Vostalgic.com! at Vostalgic. 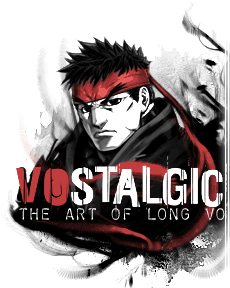 Vostalgic and all related Artwork are copyright 2010 Long Vo. All rights reserved. All content posted from other sources are copyright their respective owners.